Xiaomi Mi Remote controller Application is designed specifically for users with Xiaomi IR transmitter enabled devices. Download Xiaomi Mi Remote controller v5.3.5a from here or here. 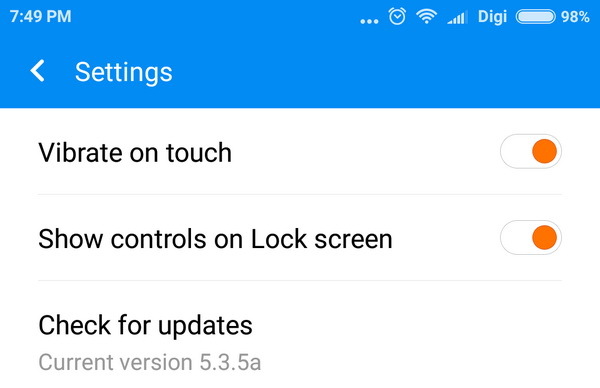 (Mi Remote_com.duokan.phone.remotecontroller v5.3.5a.apk – 16.66 MB) Download previous version 5.3.5 from here. Millet official produced universal remote applications can be home appliances convenient remote side. I can not find the remote control? Come a little mischief? Millet universal remote control to help you. We also provide you with comprehensive television program services, allowing you to quickly find your favorite TV shows and can switch the TV to the appropriate channels, but also directly watch programs on your phone. Use millet universal remote control, watching TV can be a better place. 1. Most mobile phones have an infrared function can be used infrared universal remote control and click on the television to change the channel function. 2. All smart phones can use Wi-Fi remote control function, you can better control the millet smart TV / box and all support for standard protocols Smart TV. 3. All smart phones can use the TV program information service, including viewing program information and program appointment reminders and so on. Welcome millet universal remote control, make life smarter. What do you think about this new version of Xiaomi Mi Remote controller?